This article is about the German/West German air force after World War II. For the World War II air force of Germany, see Luftwaffe. For the World War I air force of Germany, see Luftstreitkräfte. For the air force of East Germany, see Air Forces of the National People's Army. For other uses, see German Air Force (disambiguation). The German Air Force (German: Luftwaffe (German pronunciation: [ˈlʊftvafə] ( listen)), the German-language generic term for air force) is the aerial warfare branch of the Bundeswehr, the armed forces of Germany. With a strength of 27,767 personnel (31 December 2018), it is the fourth largest air force within the European Union, after the air forces of the United Kingdom, France, and Italy. Although its budget has been significantly reduced since the end of the Cold War in 1989–1990, the Luftwaffe is still among the best-equipped air forces in the world. The commander of the German Air Force is Lieutenant General Ingo Gerhartz. In 2015, the Air Force uses eleven air bases, two of which host no flying units. Furthermore, the Air Force has a presence at three civil airports. In 2012, the Air Force had an authorized strength of 28,475 active soldiers and 4,914 reservists. After World War II, German aviation was severely curtailed, and military aviation was completely forbidden after the Luftwaffe of the Third Reich had been disbanded by August 1946 by the Allied Control Commission. This changed in 1955 when West Germany joined NATO, as the Western Allies believed that Germany was needed to counter the increasing military threat posed by the Soviet Union and its Warsaw Pact allies. Therefore, on 9 January 1956, a new German Air Force called Luftwaffe was founded as a branch of the new Bundeswehr. Many well-known fighter pilots of the Wehrmacht's World War II Luftwaffe joined the new post-war air force and underwent refresher training in the USA before returning to West Germany to upgrade on the latest U.S.-supplied hardware. These included Erich Hartmann, Gerhard Barkhorn, Günther Rall and Johannes Steinhoff. Steinhoff became commander-in-chief of the Luftwaffe, with Rall as his immediate successor. Another pilot of World War II, Josef Kammhuber, also made a significant career in the post-war Luftwaffe, retiring in 1962 as Inspekteur der Luftwaffe (Chief Inspector of the Air Force). Despite the partial reliance of the new air force on soldiers who had served in the Wehrmacht's air arm, there was no organizational continuity between the old and the new Luftwaffe. This is in line with the policy of the Bundeswehr on the whole, which does not consider itself a successor of the Wehrmacht and does not follow the traditions of any other previous German military organization. The first volunteers of the Luftwaffe arrived at the Nörvenich Air Base in January 1956. In the same year, the Luftwaffe was provided with its first aircraft, the US-made Republic F-84 Thunderstreak. At first, the Luftwaffe was divided into two operational commands, one in Northern Germany, aligned with the British-led Second Allied Tactical Air Force, and the other in Southern Germany, aligned with the American-led Fourth Allied Tactical Air Force. In 1957, the Luftwaffe took command of the Army Air Defence Troops located in Rendsburg and began the expansion of its own air defence missile capabilities. The first squadron to be declared operational was the Air Transport Wing 61 at Erding Air Base, followed by the 31st Fighter-Bomber Squadron at Büchel Air Base. In 1958, the Luftwaffe received its first conscripts. In 1959, the Luftwaffe declared the 11th Missile Group in Kaufbeuren armed with MGM-1 Matador surface-to-surface tactical nuclear cruise missiles operational. The same year Jagdgeschwader 71 (Fighter Wing 71) equipped with Canadair CL-13 fighters became operational at Ahlhorner Heide Air Base. All aircraft sported—and continue to sport—the Iron Cross on the fuselage, harking back to the pre-March 1918 days of World War I, while the national flag of West Germany is displayed on the tail. In 1963, the Luftwaffe saw its first major reorganization. The two operational Air Force Group Commands – Command North and Command South were both split into two mixed Air Force divisions containing flying and air defence units and one Support division. Additionally, a 7th Air Force division was raised in Schleswig-Holstein containing flying units, missile units, support units and the German Navy's naval aviation and placed under command of Allied Forces Baltic Approaches. In 1960, the Luftwaffe received it first Lockheed F-104 Starfighter jets. The Starfighter remained in service for the entire duration of the Cold War, with the last being taken out of service in 1991. The Luftwaffe received 916 Starfighters, 292 of which crashed, resulting in the deaths of 116 pilots. The disastrous service record of the Starfighter led to the Starfighter crisis in 1966 as a reaction to 27 Starfighter crashes with 17 casualties in 1965 alone. The West German public referred to the Starfighter as the Witwenmacher (widow-maker), fliegender Sarg (flying coffin), Fallfighter (falling fighter) and Erdnagel (tent peg, literally "ground nail"). On 25 August 1966, the German Defence Minister Kai-Uwe von Hassel relieved the Inspekteur der Luftwaffe Generalleutnant Werner Panitzki, and transferred Colonel Erich Hartmann, commanding officer of the 71st Fighter Squadron, as both had publicly criticized the acquisition of the Starfighter as a "purely political decision". On 2 September 1966, Johannes Steinhoff, with Günther Rall as deputy, became the new Inspekteur der Luftwaffe. Steinhoff and his deputy Günther Rall noted that the non-German F-104s proved much safer. The Americans blamed the high loss rate of the Luftwaffe F-104s on the extreme low-level and aggressive flying of German pilots rather than any faults in the aircraft. Steinhoff and Rall went to America to learn to fly the Starfighter under Lockheed instruction and noted some specifics in the training (a lack of mountain and foggy-weather training), combined with handling capabilities (rapidly initiated, high G turns) of the aircraft that could cause accidents. Steinhoff and Rall therefore changed the training regimen for the F-104 pilots, and the accident rates fell to those comparable or better than other air forces. They also brought about the high level of training and professionalism seen today throughout the Luftwaffe, and the start of a strategic direction for Luftwaffe pilots to engage in tactical and combat training outside of Germany. However, the F-104 never lived down its reputation as a "widow-maker", and was replaced by the Luftwaffe with the McDonnell Douglas F-4 Phantom II fighter and the Panavia Tornado fighter-bomber in many units much earlier than in other national air forces. On Steinhoff's initiative, the Luftwaffe opened the German Air Force Command USA/Canada (Deutsches Luftwaffenkommando USA/Kanada) in Fort Bliss, where the Luftwaffe trained its missile and air defence troops, and pilots received their basic training. At the same time, the Luftwaffe opened a Tactical Training Command in Beja, Portugal, where pilots were trained in Close Air Support missions. Air Force Transport Command (Lufttransportkommando), with the air transport squadrons. Over the next decade, the Luftwaffe received large amounts of new equipment, including in 1968 the first C-160 Transall transport planes, in 1974 the F-4 Phantom II fighter-bombers, in 1978 the first Alpha Jet Version A light attack jets and in 1979 the first of 212 Panavia Tornado fighters. In 1986, the air defense forces began to replace their Nike Hercules missile systems with state of the art surface-to-air missile systems: first to arrive was the MIM-104 Patriot system, followed one year later by Roland short range missile system. Germany is participating in NATO's nuclear sharing concept. Nuclear sharing is a concept that involves member countries without nuclear weapons of their own in the planning for the use of nuclear weapons by NATO, and in particular provides for the armed forces of these countries to be involved in delivering these weapons in the event of their use. Soon after its founding, the German Air Force began to train with the US Seventeenth Air Force in handling, arming and delivering nuclear weapons. At first, the F-104 Starfighter was intended to be used solely as a nuclear delivery platform, armed with nuclear air-to-air and air-to-surface missiles, as well as nuclear bombs. The Tornado was the second air force plane fielded that was capable of delivering nuclear ammunition, although it was limited to delivering B61 nuclear bombs. From 1965 through 1970, Missile Wings 1 and 2 fielded 16 Pershing 1 missile systems with nuclear warheads under U.S. Army custody. In 1970, the system was upgraded to Pershing 1a with 72 missiles. Although not directly affected by the 1988 Intermediate-Range Nuclear Forces Treaty, the Luftwaffe unilaterally removed the Pershing 1a missiles from its inventory in 1991, and the missiles were destroyed. At the end of the Cold War, more than 100,000 soldiers served in the Luftwaffe. The United States still lends nuclear weapons for hypothetical use by the Luftwaffe under the nuclear sharing agreement. In 2007, 22 B61 nuclear bombs were still kept in Germany, stored at the Büchel Air Base for use with Tornado IDS fighter-bombers of Jagdbombergeschwader 33. The American nuclear weapons formerly stored at Nörvenich Air Base, Ramstein Air Base and Memmingen Air Base were all withdrawn from Germany during the mid-and-late-1990s. By international treaties between Germany and the "Big Four" powers in Europe (that formerly occupied Germany), East Germany is a nuclear-free zone. The Big Four powers are the United States, Russia, the United Kingdom, and France, and with the latter three having no nuclear weapons in Germany anymore. After German reunification in October 1990, the aircraft and personnel of the former GDR air force, the Luftstreitkräfte der NVA were taken. The remnants of the East German Air Force were placed under the newly formed 5. Luftwaffendivision (5th Air Force Division) in Strausberg. In 1993, the division was renamed 3. Luftwaffendivision, moved to Gatow in Berlin and in 1995 assigned to NATO. By 1990, the East German plane markings had been replaced by the Air Force Iron Cross, the first time Soviet-built aircraft had served in a NATO air force. However, as the Luftstreitkräfte der NVA were supplied exclusively with Eastern Bloc-produced aircraft, such as the Sukhoi Su-17, MiG-21, MiG-23 and MiG-29 fighters, most of the equipment was not compatible with the West German NATO equipment and therefore taken out of service and sold or given to new members of NATO in Eastern Europe, such as Poland and the Baltic states. An exception to this was the Jagdfliegergeschwader 3 "Vladimir Komarov" (Fighter Wing 3 "Vladimir Komarov") in Preschen Air Base. The Jagdfliegergeschwader 3 flew brand new MiG-29 fighters. 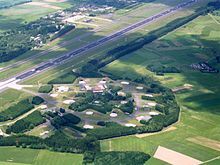 On 1 June 1993, the wing was renamed Jagdgeschwader 73 (Fighter Wing 73) and on 1 October 1994 completed its move to its new home at Laage Air Base. The pilots of JG 73 were some of the most experienced MiG-29 pilots in the world. One of their primary duties was to serve as aggressor pilots, training other pilots in dissimilar combat tactics. The United States sent a group of fighter pilots to Germany during the Red October exercise to practice tactics against the aircraft they were most likely to meet in real combat. The MiG-29s of JG 73 were fully integrated into the Luftwaffe's air defence structure and the first Soviet Bloc aircraft to be declared operational within NATO. With the introduction of the Eurofighter Typhoon imminent, the decision was taken to withdraw the MiG-29. All German MiG-29s, save one, were sold to Poland for the symbolic price of €1 apiece. On 9 August 2004, the last MiG-29s landed in Poland where they continue to serve in the 41st Tactical Squadron of the Polish Air Force. 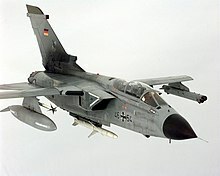 The Luftwaffe experienced combat action for first time since World War II during September 1995 in the course of Operation Deliberate Force, when six IDS Tornado fighter-bombers, equipped with forward looking infrared devices, and escorted by eight ECR Tornados, supported NATO's artillery missions on positions of the Bosnian Serbs around Sarajevo, Bosnia & Herzegovina. In March 1999, the Luftwaffe became involved in direct combat role as part of the Kosovo War along with the other NATO powers. This event was noted as significant in the British press with The Sun running the headline "Luftwaffe and the RAF into battle side by side". The Luftwaffe sent in Fighter Bomber Wing 32, equipped with ECR Tornados, which flew missions to suppress enemy air defences in and around Kosovo. These fighter-bombers were equipped with an electronic countermeasures pod, one AIM-9 Sidewinder air-to-air missile for self-defence, and an AGM-88 HARM air-to-ground missile (anti-radar). The bomber wing flew 2108 hours and 446 sorties, firing 236 HARM missiles at hostile targets. No manned Luftwaffe planes were lost in combat during this campaign. In 2005 and 2008, Luftwaffe F-4F Phantom II fighter planes took part in the Baltic Air Policing operation (of NATO), and these fighters were supplemented in 2009 by units flying the Typhoon. In 2006, to support military operations in Afghanistan, the Luftwaffe sent over several Panavia Tornado reconnaissance planes from Aufklärungsgeschwader 51 "Immelmann" (the 51st Reconnaissance Wing "Immelmann"), stationed in Mazar-i-Sharif, Northern Afghanistan. There have also been assorted German Army helicopters flying from the Luftwaffe Air Base in Mazar-i-Sharif. Also, Luftwaffe C-160 Transall have flown transport plane missions in and around Afghanistan. Since the 1970s, the West German (and, post reunification, German) Luftwaffe (as well as many other European air forces) has actively pursued the construction of European internationally made warplanes, such as the Panavia Tornado and the Eurofighter Typhoon introduced into the Luftwaffe in 2006. On 13 January 2004, the Minister of Defence, Peter Struck, announced major changes in the future of the German armed forces. A major part of this announcement was a plan to cut the number of fighter planes from 426 in early 2004, to 265 by 2015. Assuming that the plans to order 180 Typhoons is carried out in full, and all of the F-4 Phantoms are removed from service, this would cut the number of Tornado fighter-bombers down to just 85. In the past, the Bundesmarine's naval air wing (the Marineflieger) received 112 Tornado IDS planes. However, during late 2004, the last unit of Bundesmarine Tornados was disbanded. The entire maritime combat role was assigned to the Luftwaffe, one unit of which has had its Tornado fighters equipped to carry Kormoran II missiles and American HARM missiles. As of 2014, a significant proportion of Germany's military aircraft was reported to be unserviceable. It has been reported that the Sea Lynx helicopters have experienced cracking in their tails, that around half of the Eurofighters and Tornados are not currently airworthy, and that the aging C-160 fleet remains in limited service while awaiting the introduction of the Airbus A400M, the first of which was delivered in December 2014. Ursula von der Leyen admitted that, due to the poor state of the Bundeswehr's equipment, Germany was no longer able to fulfill its NATO commitments. The German Air Force was one of the founding members of the European Air Transport Command headquartered in Eindhoven - The Netherlands and most of the Transport & Tanker assets have been transferred under EATC management. Replacement of the current four Airbus A310 MRTT by the Airbus A330 MRTT was approved in 2018 by joining the acquisition of four by the Royal Netherlands Air Force. Future plans are the replacement of the ageing Sikorsky CH-53 Sea Stallion, which were acquired in the 1970s, by 40-70 Boeing CH-47 Chinook or Sikorsky CH-53K King Stallion from 2022 onwards. The German Luftwaffe participated in the Israeli Air Force exercise “Blue Flag”, the country's largest international air combat exercise, designed to simulate extreme combat scenarios. The German Air Force's six Eurofighter Typhoon fighter jets were from Tactical Air Force Squadron 73 Steinhoff from Rostock. It is the first German participation in the Blue Flag exercise. In 2018, the Air Force issued a request for information from manufacturers about four potential aircraft to replace the aging Panavia Tornados - the Eurofighter Typhoon, F-15 Advanced Eagle, F/A-18E/F Super Hornet and F-35 Lightning.In January 2019, it was announced that the F-35 Lightning had been dropped from the shortlist, with the Eurofighter Typhoon and Boeing F/A-18 Super Hornet under consideration. Due to the problems with the A400M, and in service limitations, the German Air Force will acquire three * C130J Super Hercules Transport and three * KC-130J Tanker Aircraft (delivery planned 2020-2021), which will be jointly operated with the French Air Force's two * C-130J and two * KC-130J Aircraft (delivery planned 2018-2019). The current commander of the German Air Force is Lieutenant General Ingo Gerhartz. The Inspector of the Air Force (Inspekteur der Luftwaffe) is the commander of Air Force Command (Kommando Luftwaffe), a body created in 2013 by the merger of the Air Force Office (Luftwaffenamt), German Air Staff (Führungsstab der Luftwaffe), and Air Force Forces Command (Luftwaffenführungskommando). Similar to the Air Staff of the United States Air Force, the German Air Force Command is a force providing command, not an operational command. The Air Force Command is tasked with ensuring the combat readiness of the German Air Force combat units, which during operations would either be commanded by a NATO command or the Joint Operations Command of the Bundeswehr. The Air Force command directly controls three higher commands. The creation of the Air Force Command was part of a reorganization of the Bundeswehr as a whole, announced by Thomas de Maizière in 2011, which also involved the Air Force shrinking to 23,000 soldiers and thus undergoing major restructuring at all levels. In addition to the higher command authorities, the three air divisions, the Air Force Training Command, and Air Force Weapon Systems Command, were disbanded. The three surface-to-air missile units will merge into a single wing in Husum in Northern Germany. The wing fields 14 MIM-104 Patriot and 4 MANTIS systems. The three air transport wings will be merged into a single wing based at Wunstorf Air Base, which will field 40 A400M Atlas transport planes. The Luftwaffe will field three Multirole Eurofighter Wings, each with two squadrons for a total of 143 Eurofighter Typhoon. A fighter-bomber wing fielding Panavia Tornado IDS planes remains in service at Büchel Air Base. The Reconnaissance Wing 51 will remain in service at Schleswig Air Base and add one drone squadron to its Panavia Tornado ECR squadron. Individual Air Force units are either part of the Air Force Operational Forces Command or the Support Forces Command. They only fall under the command of the Air Operations Center when on deployment or attached to EU or NATO organizations. In light of the destroyed infrastructure of West Germany post–World War II, the restrictions on aircraft production placed on Germany and the later restrictive flying zones available for training pilots, the reconstructed Luftwaffe trained most of its pilots tactically away from Germany, mainly in the United States and Canada where most of its aircraft were sourced. During the 1960s and 1970s, a very large number of Luftwaffe jet crashes—the Luftwaffe suffered a 36 percent crash rate for F-84F Thunderstreaks and an almost 30 percent loss of F-104 Starfighters—created considerable public demand for moving Luftwaffe combat training centers away from Germany. As a result, the Luftwaffe set up two tactical training centres: one, like those of many of the NATO forces, at the Royal Canadian Air Force base at Goose Bay; and the second in a unique partnership with the United States Air Force at Holloman Air Force Base in New Mexico (F-104 pilots had already been trained at Luke Air Force Base, Arizona, since 1964). Both facilities provide access to large unpopulated areas, where tactical and combat training can take place without danger to large populations. F-4Es of the 1st GAFTS. On 1 May 1996, the Luftwaffe established the German Air Force Tactical Training Center (TTC) in concert with the United States Air Force 20th Fighter Squadron at Holloman Air Force Base in New Mexico, which provides aircrew training in the F-4F Phantom II. The TTC serves as the parent command for two German air crew training squadrons. The F-4 Training Squadron oversees all German F-4 student personnel affairs and provides German instructor pilots to cooperate in the contracted F-4 training program provided by the U.S. Air Force (20th Fighter Squadron). A second TTC unit, the Tornado Training Squadron, provides academic and tactical flying training, by German air force instructors, for German Tornado aircrews. The first contingent of Tornado aircraft arrived at Holloman in March 1996. More than 300 German air force personnel are permanently assigned at Holloman to the TTC, the only unit of its kind in the United States. The German Air Force Flying Training Center activated on 31 March 1996, with German Air Force Chief of Staff Gen. Portz and U.S. Air Force Chief of Staff Gen. Michael Ryan present. The Luftwaffe has since stationed up to 800 personnel at Holloman for training exercises, due to limited training space in Europe. In September 2004, the Luftwaffe announced a reduction in its training program by about 20%. By the end of 2006, 650 Luftwaffe personnel and 25 Tornado aircraft were assigned to Holloman. A400M wing to be formed. The Luftwaffe has set up a total of 5 training institutions, namely the Offizierschule der Luftwaffe, Unteroffizierschule der Luftwaffe, Luftwaffenausbildungsbataillon, Fachschule der Luftwaffe and Technische Ausbildungszentrum der Luftwaffe, for training catering both personnel in active service and civilians willing to enter the Luftwaffe. Originally German Air Force aircraft carried an Iron Cross — appearing to be closely modeled on that used by the 1916-17 era Imperial German Luftstreitkräfte through the spring of 1918, but no longer having the white border around the crosses' "ends" (thusly resembling the straight white "flanks" of the earlier, 1918-1945 era Balkenkreuz national marking) — as an identifying feature on all four wing positions and on both sides on the rear of the fuselage and a small tricolor schwarz-rot-gold German flag painted on the vertical stabilizer. Each aircraft also carried a serial number consisting of 2 letters, which identified the service and combat wing, followed by three numbers identifying the squadron and the number of the plane within the squadron, almost graphically resembling the USAF's own buzz numbers of the same period. This system was changed in 1968. The large Iron Cross and serial numbers have since been replaced on all aircraft by a four number registration code, appearing somewhat in the manner of the earlier alphanumeric Geschwaderkennung code characters used by their World War II predecessor — separated by an Iron Cross in the middle: the first two numbers identify the type of aircraft and the second two numbers are a sequential for each type. When writing the registration number the Iron Cross is written as a "+". I.e. the Tornado IDS of the Air Force are numbered from 43+01 to 46+22, while the Tornado ECR of the Air Force are numbered from 46+23 to 46+57. The numbers from 30+01 to 33+99 are being used for the Eurofighter. The ranks of the Air Force are identical to the ranks of the German Army. The Air Force field dress is the same as the army field dress. The dress uniform of the Air Force is dark blue with gold-yellow wings as collar patches. As headdress a dark blue side cap or dark blue peaked cap can be worn. Members of the German Air Force Regiment wear a dark blue beret. ^ "World Air Forces 2016". Flightglobal: 19. Archived from the original on 24 June 2016. Retrieved 8 December 2016. ^ a b Heiner Möllers (2012). Tradition und Traditionsverständnis in der Deutschen Luftwaffe: Geschichte - Gegenwart - Perspektiven. BoD – Books on Demand. pp. 57–. ISBN 978-3-941571-17-4. ^ "Jagdgeschwader 71 "Richthofen"". geschichte.luftwaffe.de (in German). Archived from the original on 2019-02-04. Retrieved 2019-03-15. ^ "German F-104 losses (Ed Rasimus; LT Scott A. Norton, USN; Mike Schmitt; anon)". Archived from the original on 25 December 2014. Retrieved 24 December 2014. ^ "The Victoria Advocate - Google News Archive Search". Archived from the original on 14 July 2015. Retrieved 24 December 2014. ^ "Historic day for Germany". BBC News. 25 March 1999. Archived from the original on 18 December 2002. Retrieved 1 November 2006. ^ "The History of Fighter Bomber Wing 32". Archived from the original on 2012-03-15. Retrieved 2012-05-22. ^ "Germans takes over Baltic NATO mission". The Baltic Times. Baltic News Ltd. 29 June 2005. Archived from the original on 11 March 2007. Retrieved 1 November 2006. ^ "Germany hails Eurofighter's Baltic debut as 'mission accomplished'". Flight International. Dan Thisdell. 12 November 2009. Archived from the original on 16 November 2009. Retrieved 29 November 2009. ^ "Recce-Tornados in Afghanistan" (in German). Luftwaffe.de. 2018-02-17. Retrieved 2018-05-04. ^ "Germany Announces Major Armed Forces Cuts". Air Forces Monthly. Key Publishing. March 2004. p. 8. ^ Jordans, Frank (26 September 2014). "Breakdowns highlight Germany's struggles to project military might". www.stripes.com. Associated Press. Archived from the original on 28 September 2014. Retrieved 27 September 2014. ^ "Germany's von der Leyen admits major Bundeswehr shortfalls". www.dw.de. Deutsche Welle. 27 September 2014. Archived from the original on 28 September 2014. Retrieved 28 September 2014. ^ "German Eurofighter Typhoons demonstrate interoperability and aerial diplomacy over the Negev desert". Airbus. Archived from the original on 2018-01-10. Retrieved 2018-01-10. ^ Allison, George (25 April 2018). "Eurofighter outline why they believe Typhoon is 'the Perfect Choice for Germany'". UK Defence Journal. Archived from the original on 16 November 2018. Retrieved 26 April 2018. ^ "Germany – C-130J and KC-130J Aircraft - The Official Home of the Defense Security Cooperation Agency". www.dsca.mil. Archived from the original on 2018-07-04. Retrieved 2019-02-08. ^ "France –C-130J Aircraft - The Official Home of the Defense Security Cooperation Agency". www.dsca.mil. Archived from the original on 2019-02-09. Retrieved 2019-02-08. ^ Orbats - Scramble Archived 2013-06-24 at the Wayback Machine. Scramblemagazine.nl. Retrieved on 2013-08-16. ^ "Einsatzführungsbereich 2". German Air Force. Archived from the original on 29 April 2018. Retrieved 21 May 2018. ^ "Einsatzführungsbereich 3". German Air Force. Archived from the original on 27 April 2018. Retrieved 21 May 2018. ^ Luftwaffe (2016-07-26). "Mission accomplished – well done!" (in German). Homepage der Luftwaffe. Archived from the original on 2016-07-28. Retrieved 2016-07-28. ^ Melanie Hanz (2015-03-05). "Weniger in Upjever – mehr in Wittmund". NWZ Online (in German). Archived from the original on 2016-03-04. Retrieved 2016-04-20. ^ a b c d e f g Amt für Flugsicherung der Bundeswehr. "News - Portal Aeronautical Publications". Archived from the original on 1 June 2012. Retrieved 24 December 2014. ^ "Great Circle Search". Retrieved 24 December 2014. ^ "Ministerin: Zweiter Standort für Transportflugzeug A400M". www.bmvg.de (in German). Archived from the original on 2019-01-05. Retrieved 2019-01-23. ^ "Ein emotionales Ende nach mehr als 55 Jahren". Archived from the original on 25 December 2014. Retrieved 24 December 2014. ^ "The Military Balance 2013". Archived 2018-10-01 at the Wayback Machine, March 14, 2013. ^ "Ausbildungseinrichtungen". Luftwaffe (in German). Archived from the original on 2018-06-20. Retrieved 2018-06-21. ^ a b "Übergangslösung für die Tornado-Nachfolge gesucht". Handelsblatt. 2019. Retrieved 19 February 2019. ^ "Ministerium prüft Kauf von F-18-Kampfjet". n-tv. 2019. Retrieved 19 February 2019. ^ a b c d e "World Air Forces 2019". Flightglobal Insight. 2019. Archived from the original on 23 January 2019. Retrieved 5 January 2019. ^ "Sieben Tankflugzeuge Airbus A330 MRTT für die NATO". Bundeswehr Journal. 25 September 2017. Archived from the original on 7 May 2018. Retrieved 20 May 2018. ^ "Airbus A319 CJ (Corporate Jetliner)". Luftwaffe. Archived from the original on 20 May 2018. Retrieved 20 May 2018. ^ "Airbus A340-300". Luftwaffe. Archived from the original on 20 May 2018. Retrieved 20 May 2018. ^ Riool, Peter W. "Airbus A400M Full Production List". abcdlist.nl. Archived from the original on 22 December 2017. Retrieved 11 March 2019. ^ "Bombardier Global 5000". Luftwaffe. Archived from the original on 20 May 2018. Retrieved 20 May 2018. ^ "Materiallage der Bundeswehr: Mehr Übungen, mehr Beanspruchung – weniger einsatzbereit : Augen geradeaus". Archived from the original on 2018-05-05. Retrieved 2018-05-11. ^ "H145M LUH SOF". Luftwaffe. Archived from the original on 20 May 2018. Retrieved 19 May 2018. ^ "Cougar AS532". Luftwaffe. Archived from the original on 20 May 2018. Retrieved 20 May 2018. ^ "Germany to buy Triton". Reuters. 7 March 2017. Archived from the original on 10 December 2017. Retrieved 9 December 2017. ^ "Germany – MQ-4C Triton Unmanned Aircraft Systems (UAS) | the Official Home of the Defense Security Cooperation Agency". Archived from the original on 2018-05-11. Retrieved 2018-05-11. ^ Rheinmetall and IAI Offering Heron TP for Bundeswehr SAATEG Program Archived 2013-12-12 at the Wayback Machine. Deagel.com (2008-06-02). Retrieved on 2013-08-16. Wikimedia Commons has media related to Air force of Germany.